Kallie is gorgeous now, isn’t she? She’s very glad we’re not posting rescue photos that showed her with horribly matted fur. Even then, her beautiful eyes put a spell on everyone. She’s hoping to use their powers on you now to make you WATCH OUR VIDEO! (above) and then DONATE to help other kitties get healthy and find loving homes. Also, check out Cinderella, who doesn’t let having only 3 legs slow her down. Attacked by a raven as a tiny kitten, she survived, but lost a leg and her tail. For a shot of pure joy, watch her play in the video. Odysseus, who is blind, also takes a star turn there, figuring out a feathery toy with his sense of smell. 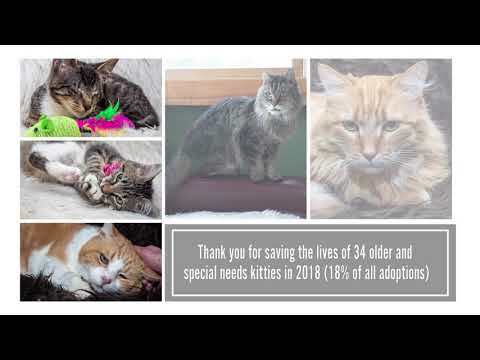 Like Kallie, Cinderella & Odysseus, the other kitties in the video are living proof that no cat need live in pain or be killed in a shelter just because it’s broken, blind, older or sick. They all deserve a chance to put their paw prints on someone’s heart. Kind people like you can make that happen.